Your Wedding at Saint Luke's Stone Cross. If you are reading this, then it may well be that you are considering getting married here at St. Luke’s. If that is the case, all of us here will do our best to help you plan for your big day. This section of the site contains some useful information and practical considerations that should help you as you start to make plans! Can anyone be married here? Marriage in church is governed by a mixture of church and state laws, and there are a number of criteria that will need to be met before you can be legally married at St. Luke’s. This might sound a bit negative and daunting, but it’s not as bad as it sounds! To be married here, one or both of you must be resident in the Parish or, be named on the Church Electoral Roll. (This is not the same as the civil electoral roll). The Church Electoral Roll is only open to regular worshipers at the church. 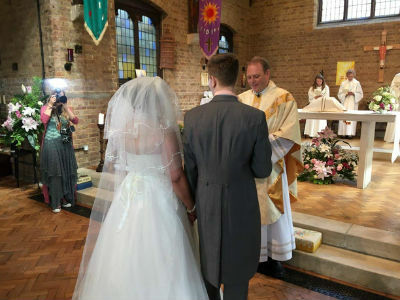 If there are exceptional personal or other reasons, it is possible to be married in any church by ‘Archbishop’s or Special Licence’ Please get in touch if you think this might apply to you. What if I or my Partner have been married before? Don't worry! The Christian faith is all about forgiveness and being given a second chance in life. If you or your partner have been married before, contact Fr. James and he will be happy to talk things through with you and should be able to put your wedding in the diary! Assuming that there are no legal reasons preventing a church wedding you will want to get in touch with Fr. James sooner rather than later, to discuss things further and arrange a date. Churches, as with all marriage venues get booked very quickly and often several years in advance, so try not to leave things to the last minute. Also please try and resist booking your reception before you have spoken to the church! The cost of a church wedding is not as prohibitive as you might think. For example the total fees for 2019 including all legal and Church Fees, Flowers, Organist, Servers and the use of the church amount to £755, a small fraction of the cost of the average wedding when reception venues, photographers and honeymoons are taken into account. A church wedding is very special, in that your marriage is not only celebrated in the presence of your family and friends, but more importantly, in the presence of God. The people at Saint Luke’s will want to wish you well for your wedding and keep you in their prayers, and it would be good if we all got to know you a bit before the wedding. Our main Sunday service is welcoming and friendly and we would love to have you with us. In choosing to celebrate your marriage in church, you are asking God to bless your marriage, and as such it makes sense to make a commitment to attending church services, and perhaps exploring further your Christian faith. Please do speak anyone here if you have any questions. Children of all ages are very welcome at St. Luke’s and we have a lively Sunday school during the first half of the service if you have children and would welcome a bit of peace and quiet! We hope to be able to welcome you to St. Luke's in the near future! Making Christ known to the people of Stone Cross & North Langney.